Free-Range Layers Produce Fresh Brown All-Natural Eggs Daily On Our Non-GMO Farm. Year round you can purchase fresh all-natural eggs from the Sunrise Farms free-range flock. Our eggs are available for wholesale purchase to resell and for commercial uses. For wholesale storefront pick up, call ahead and we will have your order ready for you or arrange for regional delivery. Every Step In The Process Happens Right Here At Sunrise Farms, Bringing Farm Fresh Eggs To Your Table In One Easy Visit. 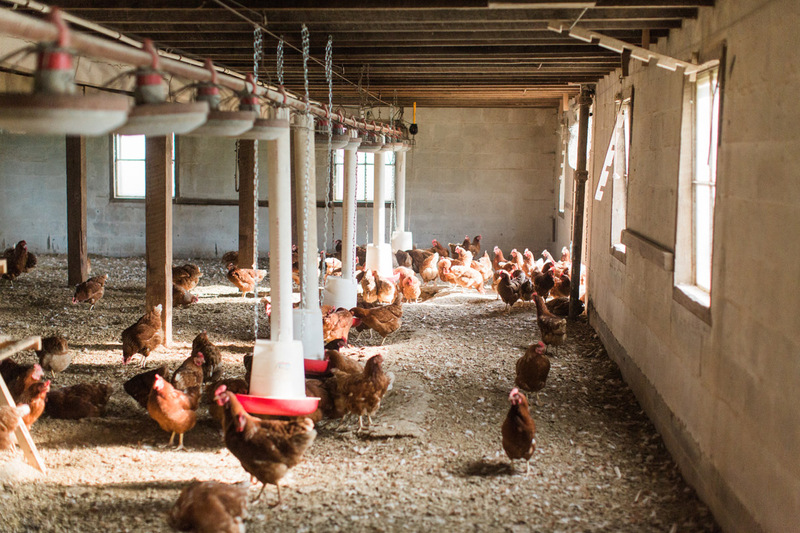 Our mill produces the non-GMO layer chicken feed we provide to our flock for self-feeding. With strict quality assurance, our non-GMO feed is known to be truly non-GMO, and contain no added hormones and no antibiotics. Our all-natural brown eggs are hand-gathered daily. We hand wash each egg, and weigh them for USDA grading. Our layers range in age and supply different sized eggs for storefront pick-up, wholesale, and regional delivery. Our layers produce eggs rich in flavor and nutrients, and free from contaminants. A Layers Life At Sunrise Farms Is All-Natural, Just Like The Delicious Eggs They Produce. Our free-range layer chickens have easy access to the outdoors and sleep indoors at night for safety. Our trusted two Great Pyrenees dogs guard the flock from foxes and other natural predators. During the day, our layers self-feed and naturally forage. Our chickens eat at will, consuming natural amounts to grow at a natural rate. The time it takes to ethically raise our flock is well worth the wait for flavorful eggs and healthy chickens. Free-range hens have been found to lay eggs that are lower in cholesterol and saturated fat. We Welcome You To Sunrise Farms Storefront! Complement your grocery shopping with our wide selection of non-GMO meat, eggs, and honey when you visit our farm storefront, located conveniently 3.5 miles off I-64 at exit 91. Contact Us Or Visit Us For Non-GMO All-Natural Eggs Today.